India was able to win four match test series against Australia by 3-0 on Monday as they won third test match as well after a interesting competition between bat and bowl on the last day. 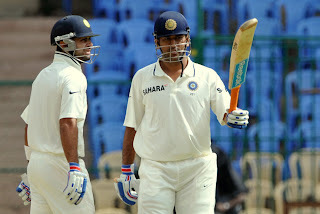 India won the the third test by 6 wickets just when 3 more overs were left in the 5th day of this test match. India got target of 136 runs after Australia got all out on 223 runs in their second inning. India got the required target for loss of 4 wickets. Virat Kohli scored highest 34 runs in second inning for India. Shikhar Dhawan was declared man of the match for his 187 runs in first inning. Last 4th test match will be played from 22nd March In Delhi between India and Australia. India will try hard to do white wash against Aussies by winning last test as well. on other hand Michael Clarke will try to save respect of his team by showing better performance at least in last match.